Herbaceous barley: hot or cold. I heard Giada de Laurentis use the word herbaceous once and have been wanting to use it ever since. Haha :) But its the perfect word to describe my lunch and dinner. Post breakfasting, I cooked some barley and put it in the fridge to chill out while I went for a short jog around my parents gorgeous neighborhood. My legs felt like cinderblocks, and it was so humid that you could have cut the air with a knife. Perfect. Then chopped some veg action including a whole tomato, some cucumber and some red pepper, then largely diced some homemade seitan (yum), and threw it all into the bowl with the cold barley + the herbs that I finely chopped. 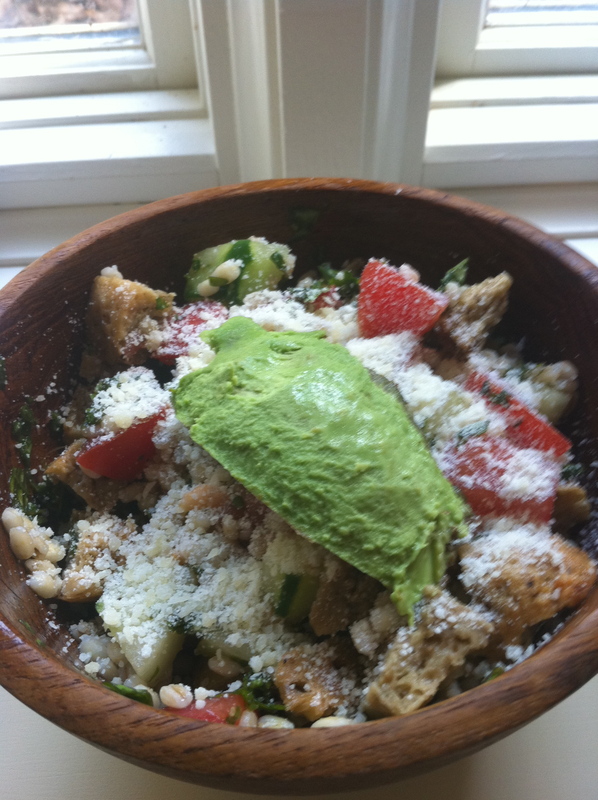 I topped it with some parmesan cheese and a hunk of avocado. Chewy from the barley and seitan, crunchy and fresh from the veg and creamy from the avocado. A bowl full of texture. I loved this lunch so much that I used barley again for dinner. It was gross and rainy out so I decided I wanted something hot, steamy and comforting. 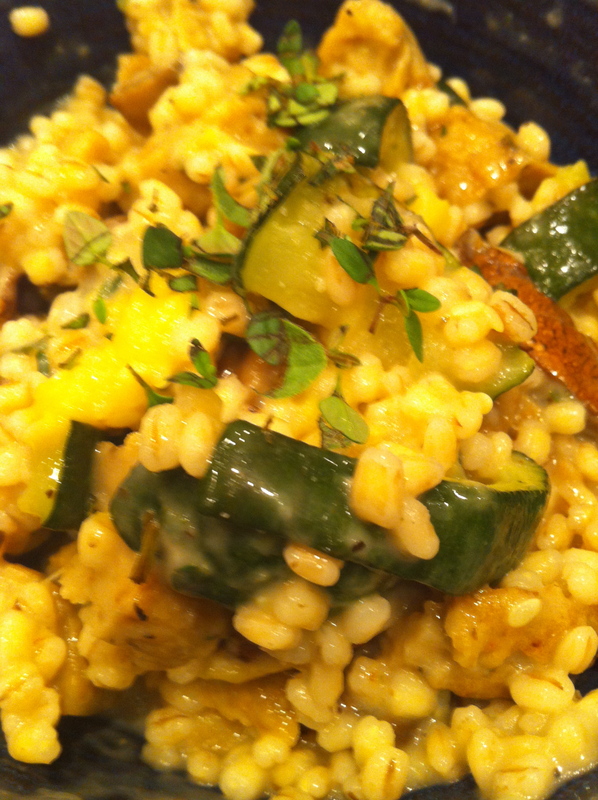 Enter roasted vegetable barley risotto. Risotto is one of my favorite foods ever. Its SO versatile! 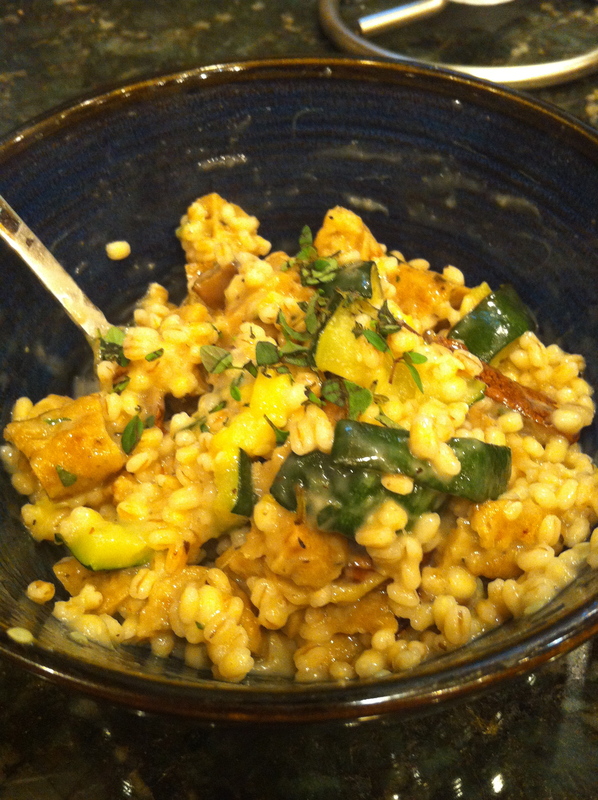 Generally its made with arborio rice, but I swapped in barley to up the fiber/ protein and it worked like a charm. Step one: I chopped and roasted a big portabello mushroom cap and a zucchini in the oven on 400* for 30 minutes (You can use any veg that tickles your fancy). Step 2: Meanwhile I cooked 1/3 cup of barley on the stove using the directions on the package but added a little extra water (I used about 1+1/3 cup). Step 3: When the barley was tender, I threw the roasted veg in + some homemade seitan for some extra protein (substitute baked tofu, or even chicken) and then I added some parmesan cheese, maybe 2-3 tablespoons? 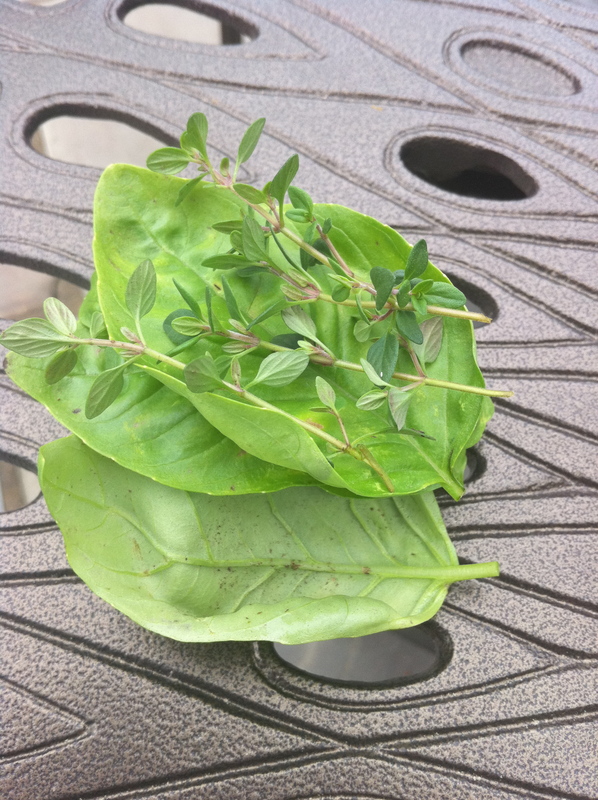 Threw in some fresh thyme and oregano from my garden and called it dinner. It deserved a close up. Excuse the lighting. You will be seeing this again. I wish I had asparagus because it would have been phenomenal roasted and tossed in as well. Have you ever had risotto? What would you or did you put in it? Whats your favorite type of cookie? I’m a boring old chocolate chip girl. Or chocolate chocolate chip. But lets be real, I’ve never met a cookie I didn’t like. I have had risotto but it has been when dining out! Never tried at home! My favorite cookie, oh gosh so many! I love fresh and warm chocolate chip out of the oven, and I dont cook them all the way, I let them still be doughy and not done all the way! So damn good!